Friends, I am using Tally Accounting Software since 1996, but not know about entry of Fixed Assets. There are too many modes of entry, but proper entry is required to get benefit of entry in future. Below screenshot help the users to make entry of fixed assets in entry. Entry should be done as Item Invoice. In case above screen is not showing with "At Zero Cost" then Press F12 and Allow Advanced entries in Master with Yes. Only quantity of fixed assets will be displayed in Stock Summary. 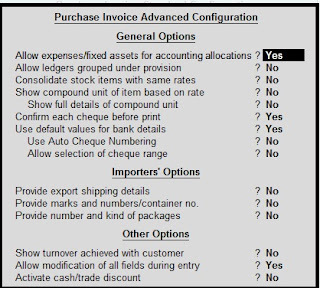 Value of fixed assets will not be displayed in Trading Account. Stock Quantity of fixed assets can be checked at any time in future. No need to pass Physical Voucher for removing Value & Quantity of Fixed Assets from Balance Sheet.